Hello and welcome to Fanatic Enterprises! Fanatic Enterprises was established to provide to the Advanced Squad Leader community quality scenarios packs for their enjoyment. Advanced Squad Leader is the ultimate Tactical Warfare Simulation Game for World War 2. Please see www.advancedsquadleader.com for the current producers of "official" ASL material. FANATIC ENTERPRISES is pleased to announce the release of FANATIC PACK #5; another fine scenario pack covering a variety of unique actions for the Advanced Squad Leader system. This scenario pack contains 9 well-tested, balanced, fun and different scenarios and 1 Platoon Leader Campaign Game. We continue to strive for excellence in each product and hope you find this pack to be a worthwhile purchase. As always our scenarios are on card stock. FE 187- So Glorious to Die: Early war Chinese vs. Japanese scenario. Set on board 41, this scenario features a defending Japanese 2nd line force supported by a few tanks waiting to take on a hoard of Chinese squads. The Japanese don’t know where the Chinese will be coming from and the Chinese will be swarming on and over the Japanese! FE 188- The World is Against Us! : Previously slated for inclusion with the Polish Campaign Pack, I held off on this one to play with it a little more. This one features the Poles defending boards 21 and 49 against a Russian assault force. The Poles have to spread themselves thin and get a couple of powerful AA Guns in support. But typically the Russians get a whole lot of bodies and more than a couple of tanks. Can the Poles keep the Russians from controlling a bunch of buildings? The Poles look like a push over, but the Russians have to cross a lot of ground quickly and with only 3 leaders, they won’t have time to rally their forces. 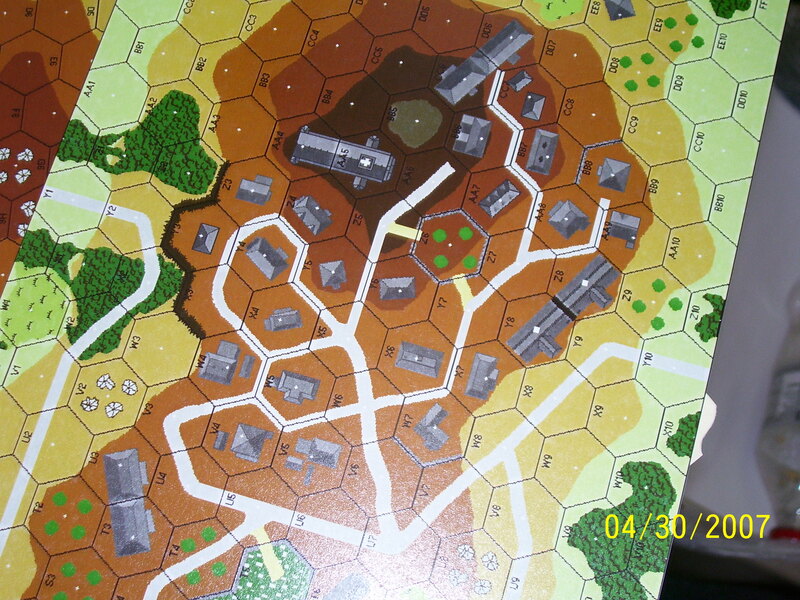 FE 189-The Tragedy at Grodno: Another one slated for the Polish Campaign pack but was pushed back to allow for a little more playtesting, this one is set on boards 49 and 51. Yes another city fight between the Russians and the Poles, but this one feels significantly different from FE 188. The Poles are still on the defense against swarms of Russians but instead of Guns they get cavalry reinforcements. Sabers against armor in this one! FE 190-Reconnaissance by Attack: We move to the frozen north for some Winter War action between the Finns and the Russians. Yes, the Grey Supermen are here but they are vastly outnumbered on boards 32 and 40. They do get an AT Gun and some fortifications (including AT Obstacles-basically large buried concrete blocks). These should hold up the Russian masses that are supported by a trio of T-28’s, with Fascines! This will surely test your armor skills. FE 191-Just Short of Victory: This one is set in France in May 1940 and features a defending force of French infantry supported by a couple of Autocannone (the ones with the 75’s that need Ammo Vehicles). They need to defend the buildings and bridges of board 23 against a German infantry/tank force that starts from board 49. A nice little tourney scenario that has a lot of replay to it and can be easily played in a couple of hours. FE 192: Hodgson’s Honey Pots: We move to the other side of the globe and have the Aussies and Japanese fighting it out on New Guinea. The Japanese get a mixed bag of infantry, fortifications and an AT Gun, but they will have to utilize all of their tank killing skills because the Aussies get 4 Stuarts! That and a handful of infantry have to fight across the difficult terrain of board 37 to the board 38 airfield, compounding their problems is a tight timetable. A nail biter to say the least, should be a challenge for both sides. FE 193: Death from Above: Ok should more accurately be Death from Below, but love that phrase, so sue me. This one features Italians vs. Germans on an Adriatic Island. Set on board 9, this has a small but determined Italian garrison holding off elite German troops. This one plays fast and furious as the Germans have to climb the hill and take out some ART Guns. FE 194- Crushing the Diversion: Once again my passion for the Axis Minors is featured. This one has Romanian Elite infantry, supported by a pair of German Assault Guns attacking some dug in defenders on board 50. How often do you get to use Axis Minor flame throwers!?! The Russians get the tools to defend the hill, infantry and fortifications, but will be hard pressed to keep back the Green Meanies! FE 195 Duty to the Emperor: Ok, this is a monster! This is late war Russian vs. Japanese and will be a full ASL feast. 30 Russian squads and 10 AFVs assault the city and rail yard boards 51 and BFPA (from Bounding Fire Productions). The Russians have to dig 24 or so Japanese troops supported by a plethora of AT weapons, fortifications and all manner of tricks. Let’s just say this will be a HUGE nasty city fight! FE CG 3-San Nen Kire! : Here is a classic PTO PL Campaign Game. This one has been around for a long time on my computer; it was formerly on the Coastal Fortress Game site and should be a fun one to play. Basically this scenario is a capture the hill battle between Japanese and American forces. Set on boards 36, 2 and 42. The Japanese have to capture the hill and hold off repeated American assaults to retake the hill. This one features a new Fortification type (Set DC-Flame) and a couple of other little rules that will make this one a blast to play. The CG starts with a night assault in the pouring rain, so it is not for the weak at heart. Fanatic Pack #5 is available for $15 plus. Shipping and Handling is $3.00 for delivery in the US, or $7 for delivery overseas for the first pack. Add $1.50 for each additional pack in the US and $3.50 for each additional pack oversees. Please send check or money order to Paul Kenny, 4 Sheffield Drive, Marlton, NJ 08053. I also accept Paypal under the name paul.kenny@rve.com. Fanatic Enterprises is pleased to present SCENARIO DESIGNER’S CORNER-an avenue to bring the ASL scenario designer in contact with the general ASL public. Scenario Designer Corner is a forum for ASL Designer’s to present their masterpieces to the world and allow players to have a shot at them, play them, playtest them and give the designers feedback on their scenarios. Click on the link on the left to go to the applicable page. Go to my dowloads page to download 5 new boards. FE 5: Light woods, small hill with sunken road and a very small village in the woods. FE 7: Tunisian Desert hills. FE 8: Lake Country, wooded village. FE 9: Farm country with irrigation fields. Many thanks to Steve Swann for making these boards a reality. The following link is to view images of the FE1 and FE2 boards you will receive if you purchase them. Please refer to the Our Products Page for details on all products available for sale Make checks or money orders out to Paul Kenny and mail to Paul Kenny, 4 Sheffield Drive, Marlton, NJ 08053. I also accept Paypal under the name paul.kenny@rve.com if using a Paypal account NOT based on a credit card .